Though there is fairly little variety in gear stats in The Elder Scrolls Online, there are still optimal setups you can use to maximize its effectiveness. 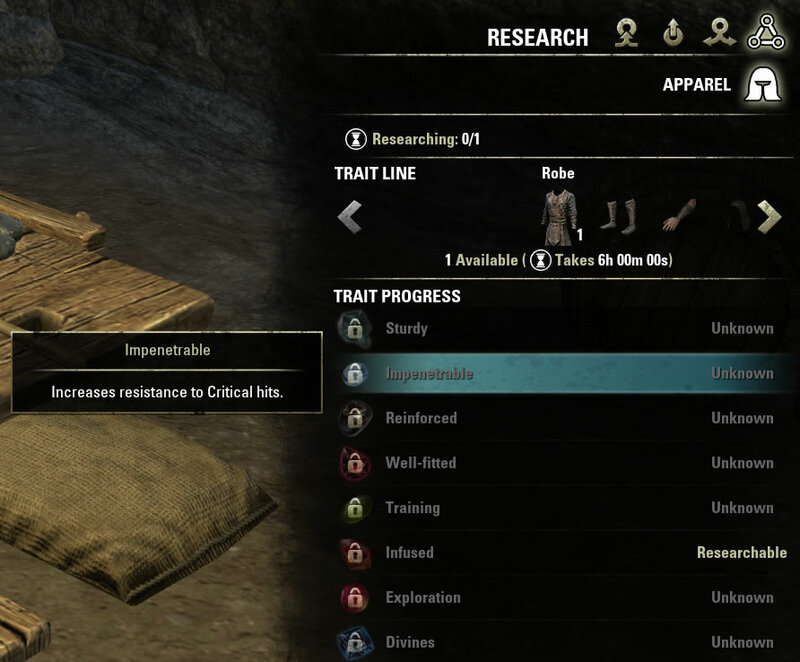 Outside of set bonuses and enchants you can only customize traits when crafting your equipment, so making sure they are the most optimal ones is even more important. In this guide you’ll learn exactly which traits are best on your gear no matter the build or setup! If you don’t want to read the boring details, click here to jump directly to the table outlining best traits: Best Traits. Since the trait names will be referenced plenty of times in this guide, here’s a table reminding you exactly what they do! Divines Increased effect of mundus stones. Exploration Increased exploration experience gained. Impenetrable Increased resistance to critical hits. Infused Increased armor enchantment effects. Reinforced Increased total armor and spell resistances. Sturdy Chance to avoid decay when killed. Training Increased armor skill line experience with this armor type. Well-Fitted Reduced cost of sprinting. Defending Increased total armor and spell resistances. Infused Increased weapon enchantment effect. Powered Reduced cooldown of weapon enchantments. Precise Increased weapon and spell critical values. Sharpened Increased armor and spell penetration. Training Increased weapon skill line experience with this weapon type. Weighted Increased weapon attack speed. For armor, you will never want to craft items with Sturdy, Training or Well-Fitted, and equally useless are Charged and Training on weapons. The biggest thing to consider is that not all items receive the same benefit from enchants. As an example, enchanting a V12 belt will give you around 45 health, while a same Veteran Rank headpiece can give you well over 100 health. Therefore, armor trait “Infused” giving you a stronger benefit from enchants is preferred on item pieces which give you the largest amounts of stats so the Infused trait will scale even further. On nearly all item setups and skill builds Infused trait is preferred on your head, chest, and pants. 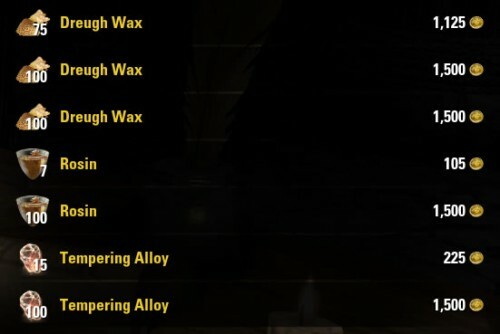 If you decided to enchant all of these slots with bonus health you would get about 370, and with Infused traits another 50 or so on top of it is a big difference. For tanks using heavy armor Reinforced is best used on Shoulders and Boots, unless you are looking to overcharge your armor further and want it on Head, Chest and Pants as well. Divines trait (increasing the effect of Mundus stones) is equally beneficial no matter which stone you prefer using. Gloves and belt slots give very little armor and enchants on them are not nearly as potent as on some other equipment slots, so they should always have the Divines trait on them. The table assumes you are using heavy armor for tanking, and light and medium armour for damage dealing. As for weapon traits, almost all damage dealers will opt to go for Precise, increasing their critical strike chance. Alternatively you may see some with Sharpened or Weighted, though it’s considered sub-optimal currently. Tanks will likely want Defending if they’re still not overcharged with Armor and Resistances. In some cases Infused, Powered, Sharpened, or Weighted can be used as well. This guide also doesn’t take PvP into account where Impenetrable trait is often a popular choice as well. Shoulders, boots, gloves, and belt slots are best with Impenetrable trait, and you should nearly always have it on gloves and belt. 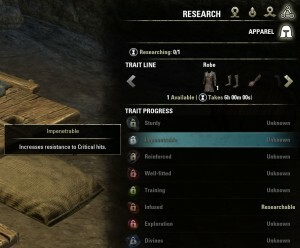 Have any other questions about best traits in ESO? Shoot them in the comments below!